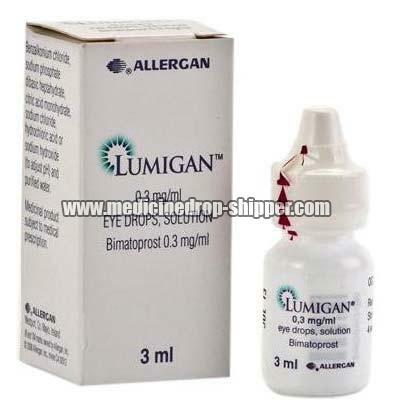 We are one of the prominent Exporters and Suppliers of Lumigan Eye Drops. Our offered Lumigan Eye Drops is used to treat certain types of glaucoma and other causes of high pressure inside the eye. Lumigan Eye Drops is also used to improve fullness, length, and color of the eyelashes in people with a condition called hypotrichosis i.e. lack of eyelash growth. Our vendors strictly follow the industrial standards to manufacture these products. We are competent to take bulk orders for it. We offer Lumigan Eye Drops at a highly reasonable price. Description : Lumigan - ophthalmic is usually used once a day, one drop in the affected eye or eyes, in the evening. Do not use more of this medication than is prescribed, as more frequent administration may decrease the effects of the medication. SinceLumigan -ophthalmic is used regularly, try to make applying the drops a part of your nightly routine. Follow your doctors instructions.Lumigan -ophthalmic reduces pressure in the eye by increasing the amount of fluid that drains from the eye.Lumigan -ophthalmic is used to treat certain types of glaucoma and high pressure in the eye(s).Lumigan -ophthalmic may also be used for purposes other than those listed in this medication guide.